The clock struck midnight and at UFC 230 Derrick Lewis turned back into a pumpkin. The Sunday Morning Rumor Mill weeps for our Black Beast. It would have been cool if Lewis shocked the world but Daniel Cormier is just too damn good. There is Jon Jones and Cormier than a huge drop off in talent and skill wise when it comes to big men in MMA. 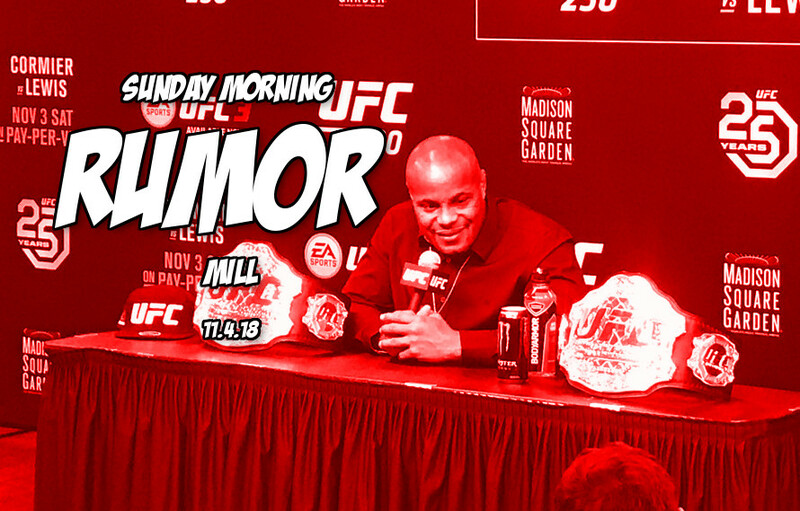 Welcome to November and welcome to your post-UFC 230 edition of the Sunday Morning Rumor Mill. Rumor is the UFC is hitting some roadblocks in the making of Daniel Cormier versus Brock Lesnar. Word is it’s not the USADA monster but a difference in money that is delaying the fight. Rumors still persist that Khabib versus Georges St. Pierre is the fight UFC wants. GSP is eyeing a 2019 return at lightweight. While it looks like Khabib may only get a slap on the wrist for the UFC 229 brawl. Steam is still picking up that the WWE will offer Daniel Cormier a huge announcing contract. Cormier still has to do a tryout but sources say that it is just a formality at this point. Huge if true but looks like Ben Askren is closer to an UFC title shot than previously thought. Askren will likely get a top five opponent in his debut. Rumors are if Askren beats Robbie Lawler, Wonderboy Thompson or Darren Till, he will earn a title shot in his second fight. Early numbers point to UFC 230 performing lower than expected at both the box office and on pay per view. About Askren getting a title shot in his second fight… Did you forget that Woodley is the champ at 170? Askren has stated over and over he will not fight Woodley. So I’m guessing that rumor stays a rumor and don’t happen unless Woodley loses in his next fight.